Granola baking in the oven is one of my favorite smells. I love the way it’s warm spiced smell permeates throughout the entire house. Over the weekend I made this Pumpkin Pie Granola and it’s smell and taste was amazing. Whenever something is baking that uses pumpkin pie spices (cinnamon, nutmeg, ginger, and cloves) it is guaranteed that your house will smell incredible and it will put you in a calming and comforting state of mind. Now that it’s fall I find myself turning on the oven a little more often and having that urge to bake whenever I possibly can. There are good and bad parts to baking. The good part is, it relaxes me and makes me happy. I love when I can bake something for someone and see how excited they are to receive it, I guess you might call it self fulfillment. The downside to loving to bake however, is trying to control myself around all the deliciousness and not eat it all. Sure I run everyday, but when there’s a loaf of banana bread or a jar of cookies around, my brain doesn’t know how to tell my mouth to stop and pretty soon I’ve just undone my 10 mile run. I wish my husband could take all these baked goodies to work, but his work is down in our basement (he works from home). Then I think I’d like to go give these treats to our neighbors, but to be honest we don’t really know any of them. It drives me crazy that we don’t have the neighborly neighbors that I dream about having. I would love to take all of my creations and share them, but the truth is I’m not sure how they would react. Would they think I’m weird for pawning food off on them every week? And what if they didn’t like it or had food allergies I didn’t know about! It’s very stressful, what would you do if you were me? In the meantime I’m stuck with all these delicious baked goods taunting me and testing my willpower to leave them alone, which by the way isn’t very strong. Back to the Pumpkin Pie Granola and it’s deliciously warm fall smell. On top of the smell being incredible the taste is perfectly spiced with cinnamon, nutmeg, ginger, and cloves. To the oats I added pumpkin seed, also known as pepitas, pecans, almonds, and of course pumpkin puree. To sweeten the granola I used a combination of maple syrup and brown sugar. Since I don’t like my granola overly sweet I kept the sweetener to a minimum. This granola is perfect to munch on in the afternoon when you start to get hungry, it makes a wonderful breakfast piled on top of some Greek yogurt, and you could even have it for dessert on top of vanilla ice cream! Whether you make this Pumpkin Pie Granola for yourself, your coworkers, or your neighbors, I hope you enjoy the fall smell that fills your house and it’s perfectly spiced and not too sweet flavor. 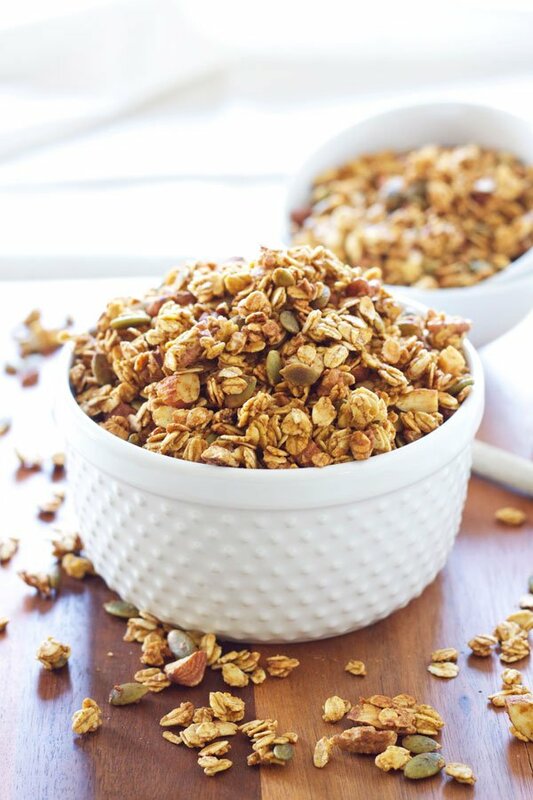 Perfectly sweetened and spiced granola with all the flavors of pumpkin pie! 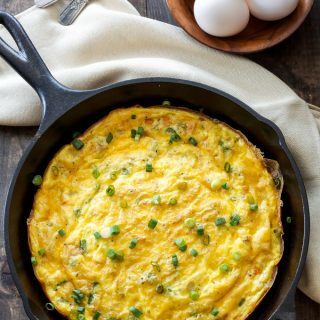 Preheat oven to 325 degrees and line a sheet pan with parchment paper or a silpat mat. In a large bowl combine the oats, pepitas, nuts, cinnamon, nutmeg, ginger, cloves, and salt. In a smaller bowl whisk the egg white for about a minute until it is thick and foamy. Add the pumpkin, oil, sugar, maple syrup, and vanilla to the egg white and whisk together. Pour the pumpkin mixture into the oat mixture and fold together with a rubber spatula. 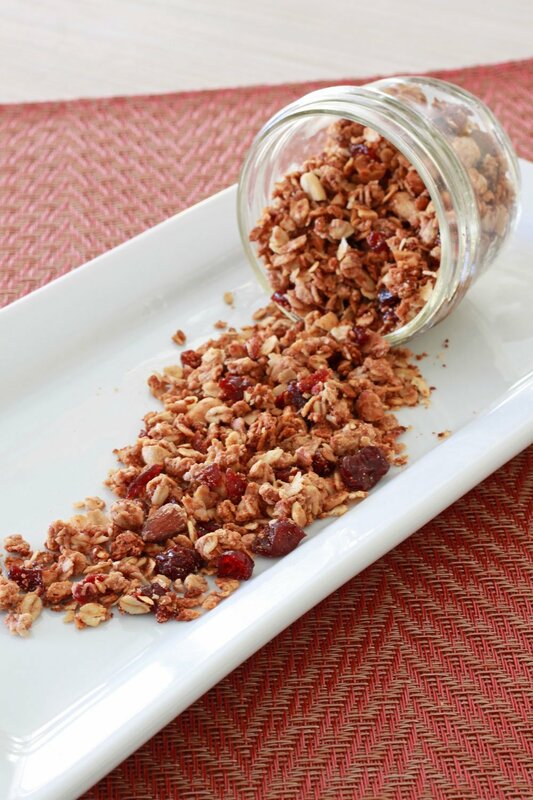 Spread the granola out onto the sheet pan in an even layer. 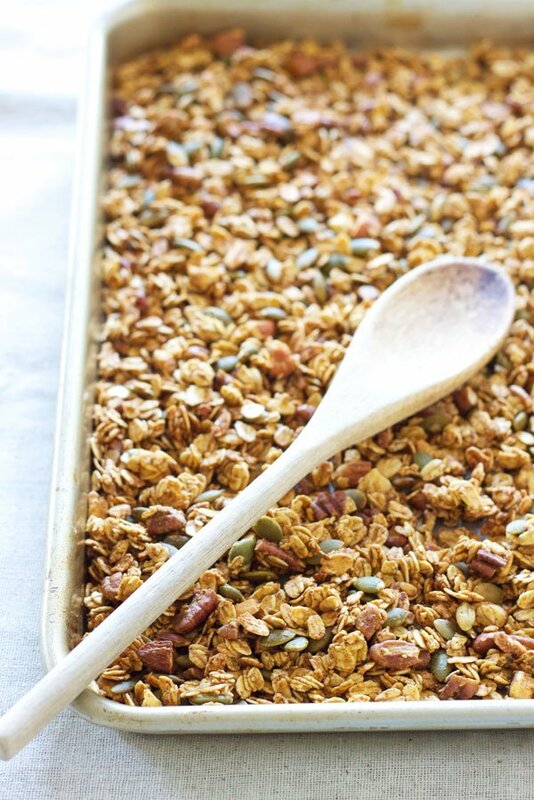 Bake the granola for about 40 minutes, stirring it every 10 minutes to keep it from burning. Let the granola cool on the sheet pan for 20 minutes before removing it. 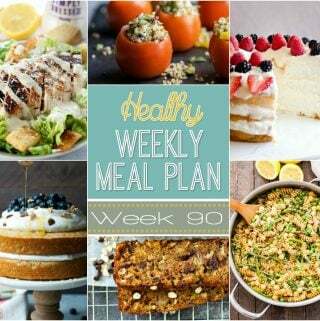 Once the granola has cooled completely store it in an airtight container for up to a week, or in the freezer for up to a month. I just LOVE the photography in this post, especially that first shot! So crisp and bright. And the granola sounds DELICIOUS! Thanks Kristy! You just made my day! 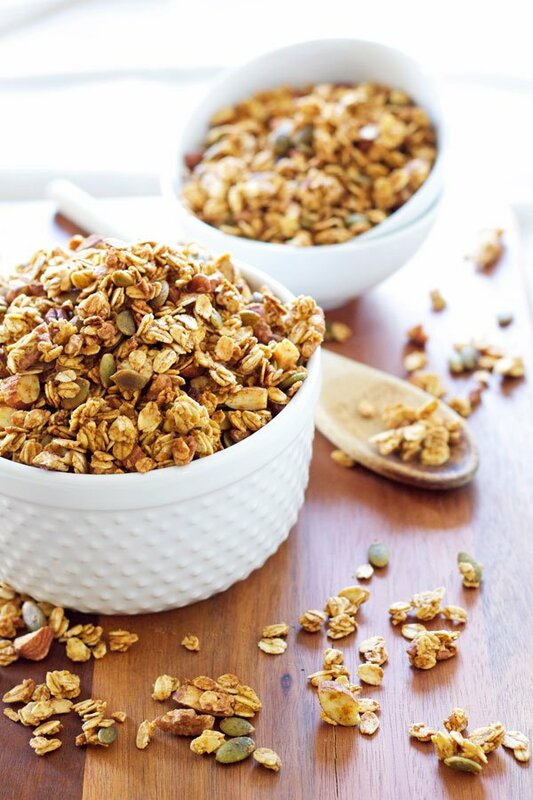 Your granola sounds so amazing! And it's a natural use for pumpkin. As food bloggers everywhere scramble to make everything under the sun with pumpkin, I feel like granola actually makes sense. Beautiful photos, too! I love pumpkin and I love granola - good job! I hope to try it soon! In the meantime, please start by approaching just 1 neighbor with a sample and an honest explanation of your profession and the desire to share samples. I'll bet you'll make a friend! After that, the next one will be easier! Love your kitties too! Take care! Now, I love me some pumpkin pie. And I love granola. 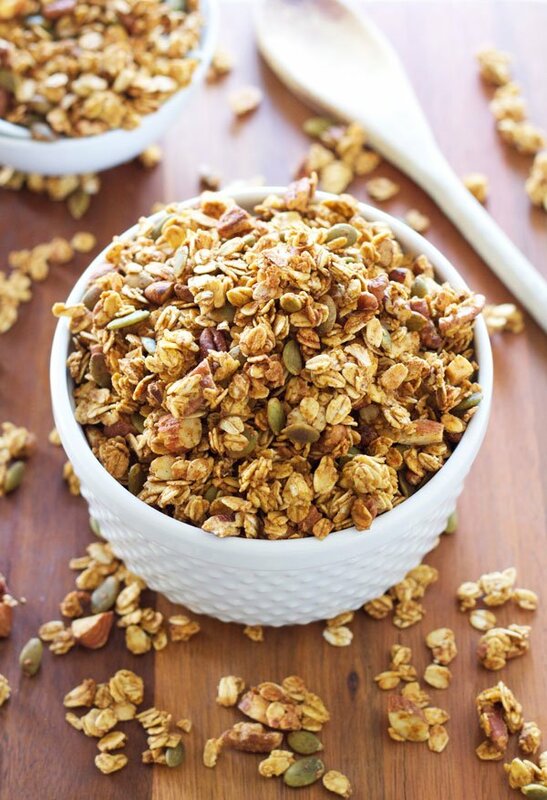 I've made pumpkin granola before, but never pumpkin PIE granola and I am kicking myself right now for it. This looks amazing and your photos are beautiful. Pinned! Thanks Amanda! It seriously some of the best granola I've made! These are some gorgeous pictures Danae! I just can't get enough pumpkin this year. This looks great! It would make such a great present or hostess gift this time of year. Thanks Lisa! 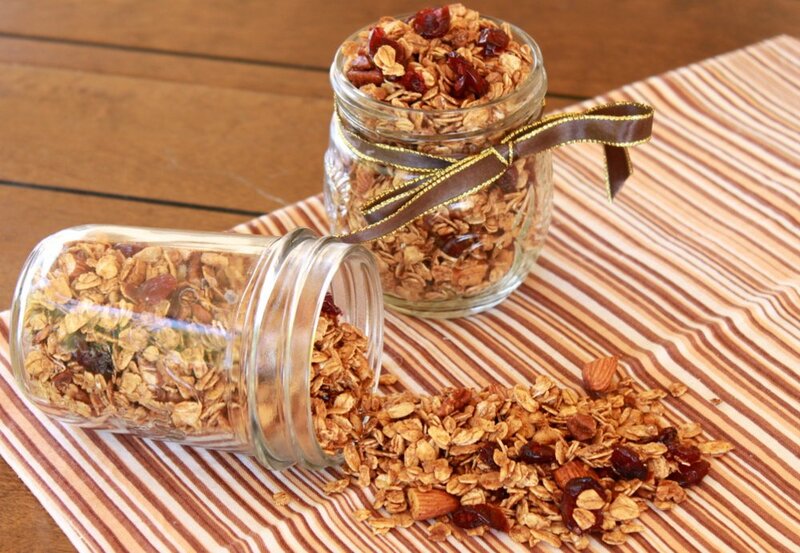 I love giving jars of granola as gifts! I have never tried a pumpkin pie flavoured granola before! What a great idea and so perfect for the fall! 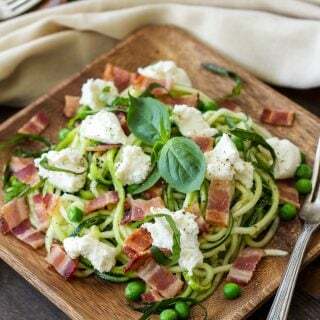 You have definitely inspired me to recreate the recipe... thanks for sharing it Danae! Thanks Thalia, I hope you enjoy it! I would share with the neighbors! They will love you and become more neighborly themselves!